Pickup trucks are not only one of the most useful vehicles that you can buy, but they are also among the most popular. While truck owners know that their vehicle is designed for practical purposes, it doesn’t mean that they have to accept that their truck bed will eventually look beaten up and worn. 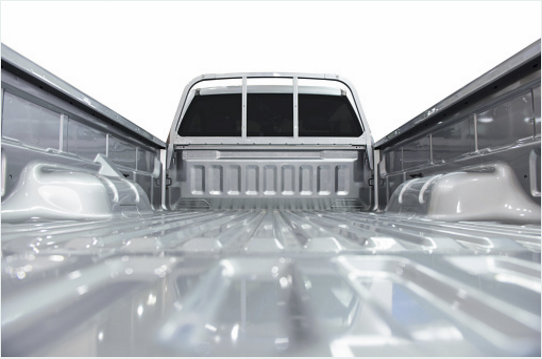 Truck bedliners make it easy and affordable to protect your truck bed from damage. They also come with a lifetime warranty, so as long as your truck is able to roll down the highway, the liner will be there to protect its bed. Spray-on bedliners form a water tight seal, and since they have a rubbery texture, the objects that you’re transporting are less likely to slide around from side to side. This feature prevents damage to the items that you’re carrying and to your vehicle. Older trucks with beds that are scratched and worn will gain a revitalized appearance with a spray-on bedliner while new ones will receive the advanced truck bed protection that they need to stay in pristine condition. Unlike other bedliners, the accessory forms to the bed. It is also easy to maintain. In fact, spray-on bedliner maintenance mainly consists of cleaning the dirt and debris off it from time to time. You can choose the color of your spray-on bedliner. Basic black is available as is white, gray or brown. You can even get a liner that's blue or red. By choosing a spray-on bedliner for your truck, you’ll have a product that comes with a lifetime warranty. Because the substance used for the bedliners is highly durable, it shouldn’t tear or stretch out. It can also withstand extreme temperature fluctuations that range from below 40 degrees Fahrenheit to 230 degrees Fahrenheit. The spray-on bedliner’s water tight seal adds to its durability while its environmentally friendly production method gives you peace of mind that you’re doing your part for the planet. In addition to being made from renewable resources, spray-on bedliners do not release volatile organic compounds. When you invest in a truck, you’re buying a vehicle that’s built to last, so why not make sure that every inch of it retains its showroom appearance? A spray-on truck bedliner will make it easier to do just that even if you put your truck to work. Call us today at Stan McNabb Collision Center for info about Spray On Bedliners!